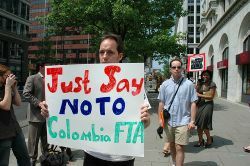 Legalizing terror: Canada-Colombia "free trade"
Part I of an interview with Manuel Rozenthal about the proposed Canada-Colombia Free Trade Agreement. Manuel Rozenthal, a long-time international solidarity activist and surgeon, is a member of the Association of Indigenous Councils of Northern Cauca, a political organization that works with indigenous communities in Southwest Colombia. He recently toured Canada, sponsored by the Canadian Labour Congress, speaking about the proposed Canada-Colombia Free Trade Agreement, a deal that has been kept almost completely out of the public eye by the Harper government. Stuart Neatby caught up with Rozenthal in Edmonton in the midst of this tour. Stuart Neatby: What do we know about the proposed Canada-Colombia Free Trade Agreement and what are its implications for the Colombian people? Manuel Rozenthal: We know very little, but what we know is of enormous concern. The so-called negotiations between Canada and Colombia started in July of this year after the visit of Harper to four Latin American countries, including Colombia. On the 26th of November, the fourth round began in Lima and there were rumours and statements pointing to the fact that it might be definitely signed soon, that they might reach an agreement. They have been kept confidential, in almost absolute secrecy, and the communiqués that have come out about the state of the negotiations are almost impossible to understand by anybody without good technical knowledge of trade deals. Secondly, it is the same or more profound agreement that was negotiated with the US that the U.S. congress is refusing to sign with Colombia because of profound concerns of environmental and human rights. To summarize the concern in a nutshell about free trade agreements, I think that first - it is not a free trade agreement. I have in my hands the Colombia-U.S. free trade agreement and it’s more than 1300 pages long. If it was truly a free trade agreement, it would be very short. It would state that your goods and products would enter my country and mine would enter yours under equal conditions of reciprocity. But, when you read this text, you actually discover that it is a supra-national constitution that allows access for multi-national corporations, financial and otherwise, to all resources, territory, labour, government contracts, and savings throughout the country with which the agreement is signed. Therefore it is an agreement signed between government officials, on behalf of corporate interests, at the expense of the wealth and the labour of the poorest countries involved, but also affecting dramatically the well-being of the poorest people and labour in the wealthy country at the same time. And that is, in a nutshell, what the agreement is. One of the biggest recent political scandals in Colombia has been the links that have emerged between high level political officials and paramilitaries. A sort of parallel scandal that has been playing out in recent months has been that of legal court cases, linking multi-national corporations to the Autodefensias Unidas de Colombia (AUC) paramilitaries as well. Can you talk about the pattern of multi-national corporate involvement with the AUC and what interests for them it actually serves to employ these paramilitaries? What is very important to do is to make the links between the use of violence and the corporate support for these death squads, all in connection or related to these free trade agreements. I can begin by examining what happened to Chiquita. Chiquita accepted in court an agreement that acknowledged that it had funnelled $1.7 million in support for the paramilitaries, which the U.S. has declared a terrorist organization. The horrendous thing about these statements is the fact that the $25 million [settlement] was given to the U.S. government! Not a cent of it went to any Colombian victim of the paramilitaries that were supported by Chiquita. Chiquita was recently sued once again by Jonathan Reiter, a lawyer in New York City. He sued them on behalf of 393 victims of the death squads, either relatives of the people who had been killed or disappeared, or people who had been directly affected by the company’s practices. What Reiter argued is that Chiquita did not have to channel funds to the paramilitaries to protect itself from threats. In fact Chiquita actually funded, trained, and armed paramilitary forces as part of its systematic operations in the country in order to increase profit, dismantle labour, and forcibly remove people from the land that they wanted to use to produce bananas. Now there’s worse evidence coming out: the paramilitaries have confessed. The highest commanders of these death squad forces have stated that every one of the six banana companies that act in Colombia has paid between three and four cents U.S. for each banana that has been produced. So in fact the amount of money that has been delivered to paramilitaries has been enormous. There are three American companies still with the largest proportional Banana production in Colombia: Chiquita, Del Monte and Dole, which have all funded and armed paramilitaries, according to the testimony of those funded by them. Some of this testimony [states that] whenever the company wanted some land, they would approach the poor peasants in the region - the rightful owners of this land - and offer to buy the land for no money at all. If these people refused to sell their land, the next thing they heard was a threat. Following the threat, if they didn’t leave, was the commission of a massacre either using chainsaws to cut people alive into pieces, or mass graves and assassinations, or mass displacement. So that’s the case of the banana plantations. Drummond, a coal and gas producing company, was also sued because a high official from Colombia witnessed Drummond officials passing lists of union leaders on to paramilitary commanders. Some of those leaders were later murdered or disappeared. Glencore, the Swiss multinational, was involved with similar kinds of activities. Then Coca-Cola was sued because union leaders at four of their plants were threatened and murdered by paramilitaries in order to dismantle their negotiated agreement and to dismantle the union. If you add up these specific cases and go around the country, you discover that these are systematic practices, that Colombia is the most dangerous place in the world for trade union workers. More than 2500 trade unionists have been murdered in the last 10 years, targeted specifically in areas that were either privatized or delivered to multi-national corporations. During the Uribe administration over the last six years, more than 500 trade union leaders have been assassinated, 28 of them this year. So there is ample evidence that terror is used in a systematic way to cheapen the cost of production and access to resources and territories in order to increase the profit of corporate interests and multinational corporations. What the free trade agreements do is to legalize and legitimize what terror has achieved for them. And that is why signing a free trade agreement with Colombia is actually becoming an accomplice to the use of terror to make profits. And terror, of course — together with extreme destruction of nature and exploitation of people — is necessarily what the free trade agreement between Canada and Colombia is all about. "I think that there is a basic ethical principle that most Canadians I know would sign for: no corporate investment in a country or a region where human rights abuses are endemic." Manuel Rozenthal, a long-time international solidarity activist and surgeon, is a member of the Association of Indigenous Councils of Northern Cauca, a political organization that works with indigenous communities in Southwest Colombia. He recently toured Canada, sponsored by the Canadian Labour Congress, in which he spoke about the proposed Canada-Colombia Free Trade Agreement, a deal which has been kept almost completely out of the public eye by the Harper government. Stuart Neatby interviewed Rozenthal in the midst of his speaking tour. In Part I of this interview, Rozenthal discusses the culture of absolute secrecy that has hung over the Canada-Colombia Free Trade Agreement, as well as the role of multinational corporations in Colombia’s political violence. In this second part, Rozenthal discusses the attacks upon the labour movement in Colombia, the role of CIDA in Colombia, and the possibilities of solidarity between the people of Canada and Colombia. Stuart Neatby: On his visit to Colombia last July, when confronted with the question of the high rate of assassination of labour leaders in the country, Stephen Harper tried to deflect this question by arguing that the number of killings of labour leaders had diminished. He viewed this as a source of progress in Colombia. What’s your response to Harper’s argument? Manuel Rozenthal: First of all more than two thousand labour leaders [have been killed] and more than 3 million people have been displaced in a country of 44 million. There used to be almost 15% of labour that was unionized about five years ago. Now, less than 3% is. It’s the impact of terror that has lead to the reduction of assassinations and not the fact that terror has been removed, or that there is less terror today. It’s the fact that they have achieved their goals, therefore they don’t murder as much as they did before. That doesn’t mean that they are not doing it. It just means that they have become more selective. They are targeting the specific sectors of people that are a threat to them. So if this is what Harper calls an achievement of this government, an achievement he supports, he’s actually coming in when the horror has been established and when the rich have closed the doors on any democracy. What role have you seen international aid, particularly that of the Canadian International Development Agency (CIDA), playing in this political violence? We know that the Canadian International Development Agency, under the Harper government, is targeting more and more aid to harmonize [Colombian laws] with the corporate interests, with the Canadian government. So this trade agreement is negotiated, by way of making resources and cheap labour accessible to transnational corporations that have some component of Canadian ownership. That will lead in economic terms immediately to a comparative advantage for these companies to work wherever these free trade agreements have been signed. If you think of the conflict, what CIDA is doing is providing assistance, much-needed of course, to those displaced in resource-rich territories. In other words, the corporate interests come in, the dirty war displaces people, and then Canada amongst others comes in to help those displaced establish themselves away from the territory and the resources that are right there. So, in this assistance, what Canada is doing finalizes this forced displacement. When I mentioned this, the Ambassador said to us, ‘the displacement is due to the war, and we have not caused the war, so we’re not responsible for solving the war.’ It is in fact the opposite: there is war so that there can be displacement for the sake of mega-projects, corporate projects in our country. If you continue to invest in a country where human rights abuses are pervasive and used for the sake of corporate interests, you’re actually promoting abuses and not solving them. So we have this horrendous extortion where, by helping those who are exploited, you end up protecting those who committed the crime. Here in Nova Scotia, we have a unique campaign that has been undertaken by the Atlantic Regional Solidarity Network. They have focused on the fact that the two major power utilities in Atlantic Canada, Nova Scotia Power and New Brunswick Power, import more Colombian coal than any other power utility in Canada. So what they’ve done over the past three years has been to make links with indigenous communities that have been displaced by coal mines and with some trade unionists, and have attempted to really bring pressure regarding these human rights abuses using consumer pressure of NSP and NBP. What other possibilities do you think there are for solidarity in Canada, with the people in Colombia, dealing with this economic and political repression? Well first, it’s fantastic that you’ve brought this example up. It’s one of the most fantastic, excellent, comprehensive actions of solidarity that not only involves compassion with the poor there, but in fact raises awareness for both countries. But the first point I would make is for Canadians to be aware of the fact that the economic model that is being used, and that which the Canadian government represents, is the problem for Canadians and for Colombians. The urgency now is to try and stop the signature of that free trade agreement between Colombia, Canada, and Peru. My suggestion is that every Canadian immediately contact their MPs, and write letters, phone them, and demand that no free trade agreement be signed with Colombia precisely because of the human rights conditions, and the conditions of exploitation. But even if the free trade agreement were signed, that doesn’t mean it would be the end of our struggle. The consciousness-raising requires that we carry on, even if this agreement is signed. My suggestion would be to not only carry on the pressure on the parliament, but also on the multinational corporations. I think that there is a basic ethical principle that most Canadians I know would sign for: no corporate investment in a country or a region where human rights abuses are endemic. If we could achieve that then occurrences and abuses such as those of Drummond or Chiquita could not happen, or at least would be monitored very carefully. Thirdly, if I asked most people in Canada if they would trust corporate interests to make political decisions about their social welfare or well-being, I’m sure most Canadians would say that they would not deliver their interests into private hands. Canadians don’t want healthcare to be privatized. So why would you then allow foreign policy to be privatized and to be in the hands of corporate interests? My suggestion would be that any and every trade agreement that Canada negotiates and signs with any other country should have the direct involvement of labour and social organizations, and cannot be legitimate unless there is a referendum, or at least the involvement in the negotiations, of representatives of social movements and organized civil society. Not of corporate civil society, but of unions [and others] so that you are directly involved as a people in what your government is negotiating on your behalf for corporate interests. I think that is an essential point to work on. And finally: target solidarity in a different way. We have had ups and downs in our relationships of solidarity with Colombia and with other countries in the Americas, such as Haiti. I think the time has come now to rethink solidarity and to not just concentrate on addressing, through compassion, the abuses of human rights. We, Colombians, Haitians, Salvadorians, Latin Americans, we are subjects of our own histories - we have our own approaches, proposals, ways of life. What we deserve is that we work together with Canadians jointly as partners, as friends, to resist and to develop alternatives to the [economic] model that is hurting our lives here and there, so that the relationship is not a patronizing one from the donors to the recipient, but actually from reciprocal counterparts that work together for resistance. We actually do not need your help. We need to be together in this. Stuart Neatby lives in Halifax and is an editor for The Dominion.